You will need to know or be able to estimate these properties plus a few more such as volume fraction φ. The normal formula uses g for gravity but if the particle is spinning at a given RPM in a centrifuge of radius rcent then the effective force is larger, grel (relative to g) and the settling is faster. The 2.18 in the formula is the familiar 2/9 from the Stokes equation multiplied by g=9.81. The significance of φ is explained below. If ρp is less than ρl as in a typical oil in water emulsion then the "settling" velocity is negative and t is the time taken for the emulsion particle to rise by h.
So far, we have assumed that the particles don't interefere with themselves. A simple, but effective approximation from Richardson and Zaki tells us that the velocity is reduced by a factor of (1-φ)4.65 where φ is the volume fraction. Clearly this means that as particles start to settle and get locally more concentrated, the rate will reduce. This app is just to give a general idea of the effects in the early stages of settling. The 0.384 comes from some assumptions about relative particle sizes and is a maximum value for a size ratio of 1.66:1. For simplicity, T is assumed to be 298K. The "Too small to settle" box goes to "Yes" when Gr < ~1 For the case of 1g, most nanoparticles will not settle easily. But as you spin the rotor, it is harder for thermal motions to resist the higher g.
Although measuring densities and viscosities is not too hard, you are unlikely to have a single, known radius. In any case, as particles start to settle, they get slowed down either according to Richardson and Zaki or by other effects such as flocculation according to Buscall-White theory. So the point of the app is to give a feel for the sort of formulation options available to you, such as changing the viscosity and density of the liquid. 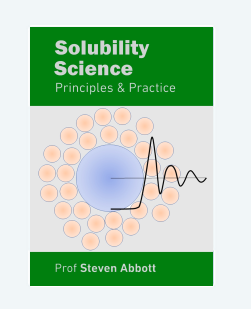 My free book expands on the content in Practical Solubility and is linked to the apps so you go straight from the eBook page to the app of interest. It can be downloaded for iBooks, for Kindle and as PDF.